Sunday’s ad is for is by Ballantine Ale, from 1958. 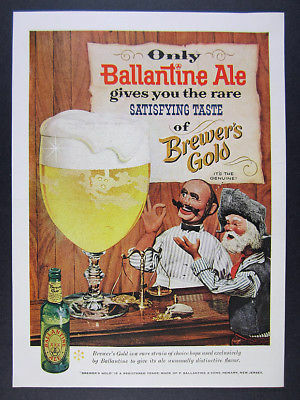 In the 1950s, Ballantine advertised the hop variety “Brewer’s Gold” as “a rare strain of choice hops” and even registered it as a trade-mark, although Brewers Gold is widely available today. In this ad, a bartender is showing off a ginormous glass of Ballantine Ale to a mountain man of some kind. Shor was born in Philadelphia to Orthodox Jewish parents – his father of Austrian descent from Germany and his mother from Russia. He and his two older sisters were raised in a home above the family candy store in South Philadelphia. When Shor was 15 years old, his mother was killed by an automobile while she sat on the stoop outside their home. His father committed suicide five years later. 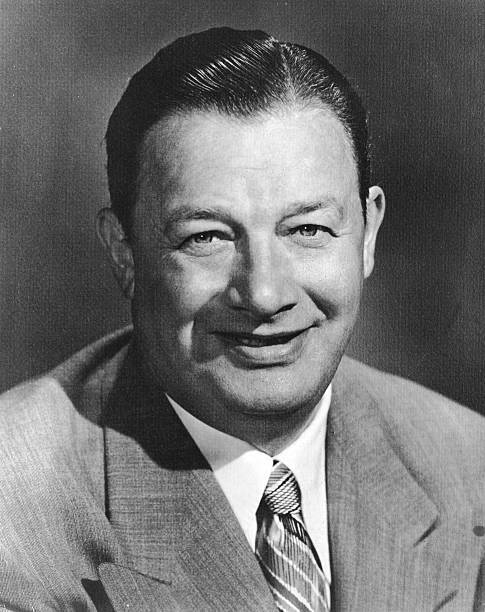 Shor attended the Drexel Institute of Technology and the Wharton School of the University of Pennsylvania before working as a traveling shirt-and-underwear salesman. Restaurateur. He was the owner and colorful host of Toots Shor’s Restaurant, a New York City landmark for over 30 years. Born in Philadelphia, he moved to New York as a teenager during the Prohibition era and gained a reputation as a speakeasy bouncer, guardian, and manager. In 1940 he opened his own restaurant and lounge at 51 West 51st Street in Manhattan; although the food was mediocre, its strong drinks and oversized circular bar quickly drew the crowds. The greats of the sports world, stage, screen and politics all hung out here. In one famous anecdote, mob boss Frank Costello and Supreme Court Chief Justice Earl Warren politely raised glasses to each other across the dining room. Shor was gruffly friendly to everybody from shoeshine boy to newsstand guy, to Joe DiMaggio, Frank Sinatra, and Jackie Gleason (who always ate there for free). Being called a “crumb-bum” by Toots meant you’d earned his praise; in contrast, his most bitter insult was to call someone “just a piece of raisin cake”. His personal motto was “I don’t care if I’m a millionaire, as long as I can live like one”, and his spendthrift ways and generosity to his regulars often left him in debt. The original Toots Shor’s closed in 1959 and reopened two years later at 33 West 52nd Street; this location was abruptly shut down in 1971 for income tax evasion. Toots’ last business ventures were failures and he died broke, but not before leaving a legendary mark on New York nightlife. 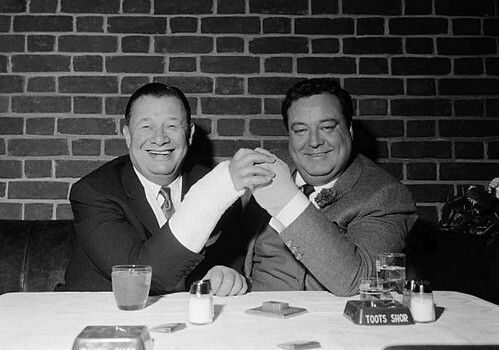 Shor went to New York City in 1930 and found employment as a bouncer at the Five O’Clock Club, which served as his introduction to celebrities. He later worked at several other nightspots: The Napoleon Club, Lahiff’s Tavern, the Ball & Chain, the Madison Royale, and Leon & Eddie’s. 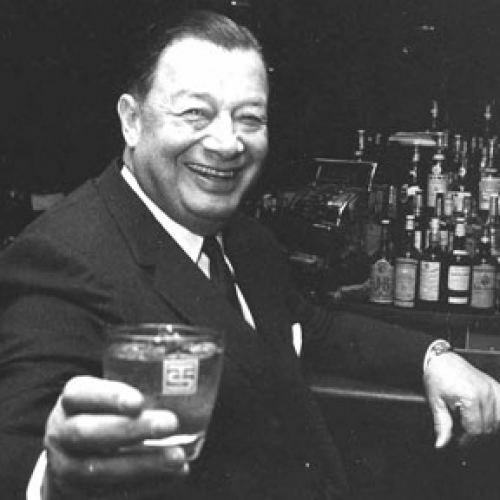 He became a man about town in Manhattan after opening his own restaurant, Toots Shor’s, at 51 West 51st Street. 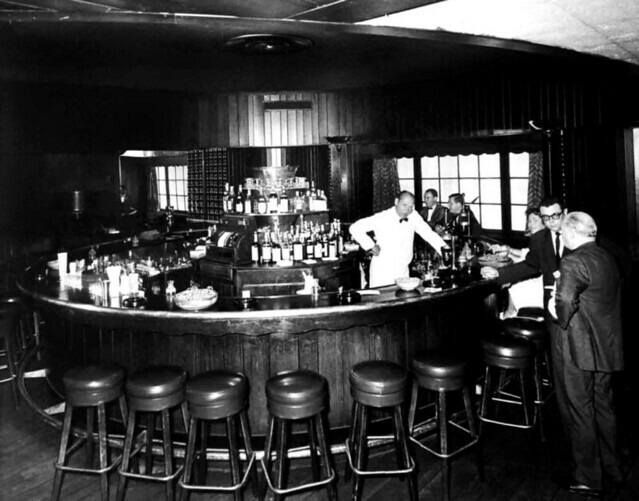 While the food there was known to be “nuttin’ fancy” – standard American, sports-bar fare such as shrimp cocktail, steak, baked potato – the establishment became well known for who frequented there and the manner in which Shor interacted with them. Shor cultivated his celebrity following by giving them unqualified admiration, loyal friendship, and a kind of happy, boozy, old-fashioned male privacy. Those whom Shor really liked were called “crum-bums”. Shor reputedly said that he didn’t care if he was a millionaire – so long as he could live like one. 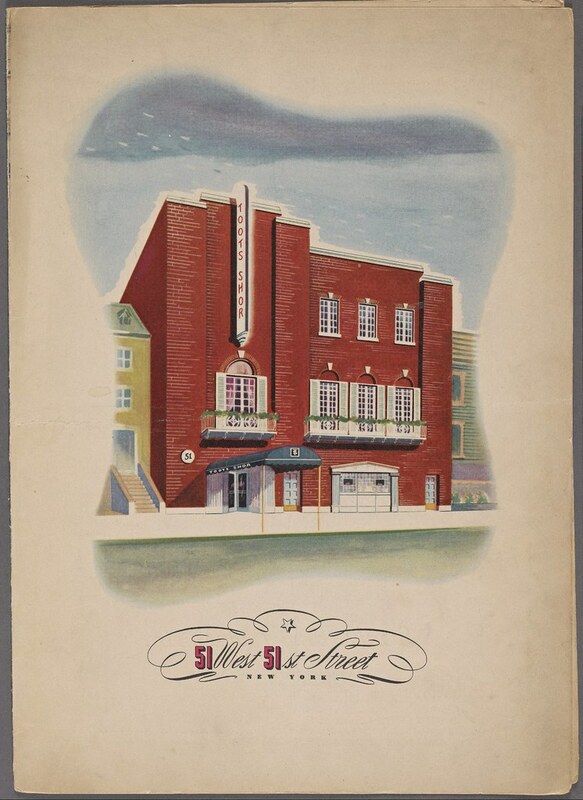 In 1959, Shor sold the lease for his 51st Street restaurant for $1.5 million to William Zeckendorf. The following year, he opened at a new location at 33 West 52nd Street and tried to emulate the decor and atmosphere of the original. The then–Chief Justice, Earl Warren, considered Toots one of his closest friends. “The Chief” showed up to be photographed with a shovel full of dirt when Toots broke ground on Toots’ 52nd street “joint”. In 1971, authorities padlocked the doors of the 52nd Street restaurant for nonpayment of federal, state, and local taxes totaling $269,516. He vowed to open again in three weeks, but 18 months passed before his restaurant at 5 East 54th Street opened. For a variety of reasons, however, his famous clientele never returned with their former regularity. 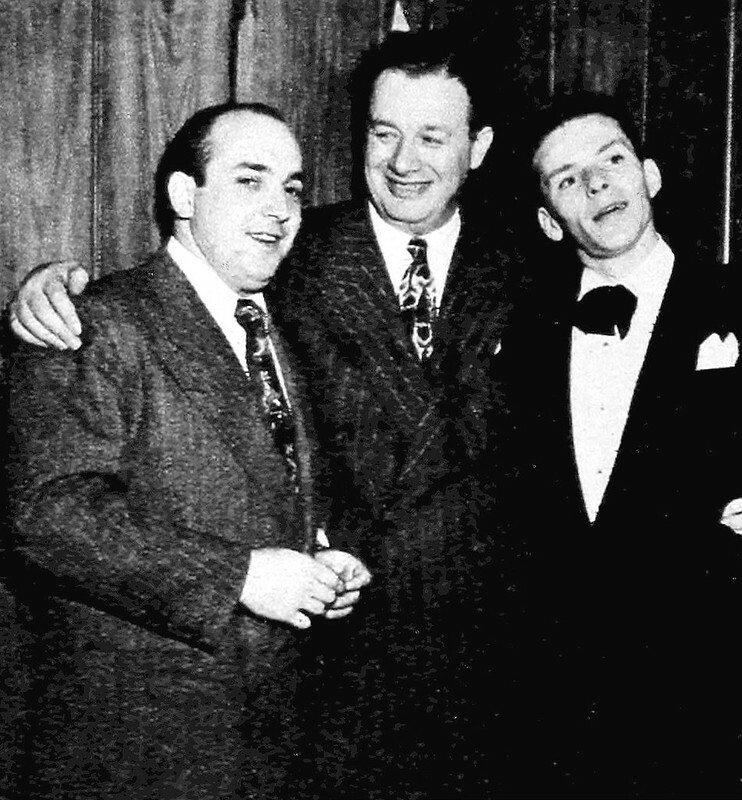 Music manager Hank Sanicola, Toots Shor, and Frank Sinatra in 1947. Toots Shor’s Restaurant was a restaurant and lounge owned and operated by Bernard “Toots” Shor at 51 West 51st Street in Manhattan during the 1940s and 1950s. Its oversized circular bar was a New York landmark. It was frequented by celebrities, and together with the 21 Club, the Stork Club, and El Morocco was one of the places to see and be seen. Joe DiMaggio often went there to eat, and that helped make it famous. Toots was said to do personal favors for Joe as well, at no cost. Jackie Gleason always ate there for free. Other notable guests included Frank Sinatra, Judy Garland, Marilyn Monroe, Orson Welles, Yogi Berra, and Ernest Hemingway (Berra and Hemingway allegedly met there). In a famous incident, Shor outdrank Jackie Gleason and left him on the floor to prove the point. Somewhat notoriously, wives were not welcome in Toots’s saloon; it was known, in the argot of the day, as a place of “booze and broads,” where ballplayers, actors and politicians mixed. Baseball players were especially welcomed; in particular, Shor admired Mickey Mantle; he also adored Joe DiMaggio. Shor always ensured that DiMaggio got first-rate service without being hassled or asked for autographs by restaurant staff, other patrons, or fans. Another prominent figure who frequented Shor’s restaurant was famed trial attorney Edward Bennett Williams. Toots Shor cultivated his celebrity following by giving them unqualified admiration, loyal friendship, and a kind of happy, boozy, old-fashioned male privacy. Those whom Shor really liked were called “crum-bums”. Shor reputedly said that he didn’t care if he was a millionaire—so long as he could live like one. Shor was rewarded after a fashion with a mention in the 1954 Bing Crosby film, “White Christmas.” Bing comments to Rosemary Clooney, while both are raiding the restaurant refrigerator of the Vermont inn where they are staying, that the food is not as fancy as Toots Shor’s. The round bar at Toot’s Shor’s place.